Hundreds of business, education and civic leaders gathered at the Newark Club Friday, June 24, for the UNCF Newark Mayor’s Masked Ball. Hosted by Mayor Ras J. Baraka, the annual fundraising event raised over $175,000 to help provide New Jersey students with the necessary resources to get to and through college. The event was sponsored by Fountain Baptist Church, PSEG, Johnson & Johnson, Berger Organization LLC., Community Baptist Church of Englewood, SUEZ, United, Bayer, Becker LLC., Gibbons P.C., Hayward Industries, and PNC Bank. Elnardo and Samantha Webster, Community Baptist Church of Englewood and Johnson & Johnson were presented with Masked Awards for their generosity in providing hope and opportunity to deserving minority youth. 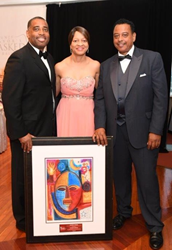 The event was co-chaired by Vaughn L. McKoy, managing director and vice president – legal of PSEG Long Island and Marnie G. McKoy, director of human resources, New Brunswick Public Schools. It featured a VIP reception, elegant dining, dancing and music from vocalists Karen J and Chandler; singer/song-writer Robin Andre, DJ Reg West, and student testimonials of UNCF’s impact.